There’s a ton of models of Remington’s 870 shotgun. And even more upgrade possibilities. I’ll go through my current 5 Remington 870 builds and why I chose each specific model and its upgrades. By the end you’ll know both which model to get…and the best upgrades for your purpose. Remington has more than 30 different countries wielding the famed 870 in their police, military, and defense forces. The Remington 870 is an American classic right up there with the Ford Mustang, Apple Pie, and Diabetes. Production started in 1950 and has continued uninterrupted into 2019. Having seen combat in Vietnam, Desert Storm, and the Global War on Terror – the 870 has been around. 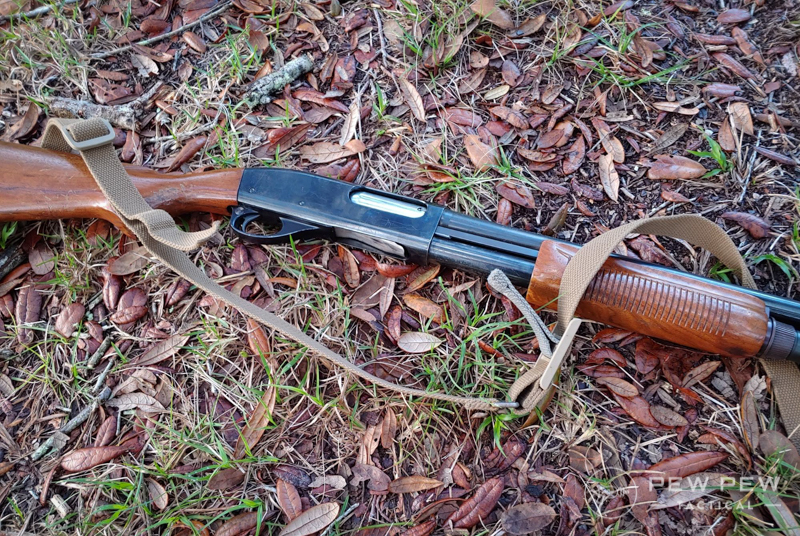 The Remington 870 has a long life of service with police forces as well. This includes the LAPD, the CHP, and the FBI. 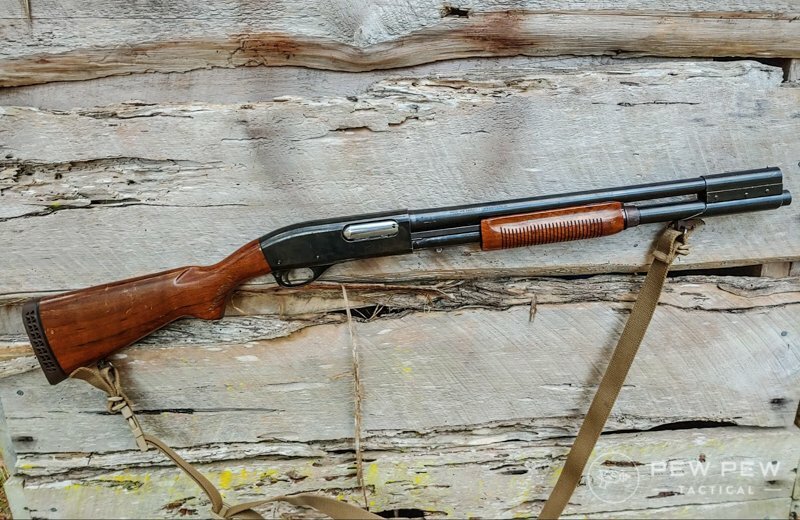 The 870 is a pump-action shotgun that features a different capacity from 4+1 to 7+1. The 870 uses dual action bars and has one of the smoothest actions out there. The 870 also has a solid steel receiver that makes it incredibly strong. It’s currently produced in 12, 20, and 28 gauge, as well as .410 bore. My first gun was a Remington 870 in .410, and I hunted many a rabbit and many a squirrel. There is also a Remington 870 just for you since it is produced in tons of different configurations for different uses. Here is a brief look at the current models of Model 870 shotguns and firearms. The most affordable 870 the Express features a matte black finish and depending on the particular model you will get hardwood furniture or synthetic furniture with a variety of finishes. 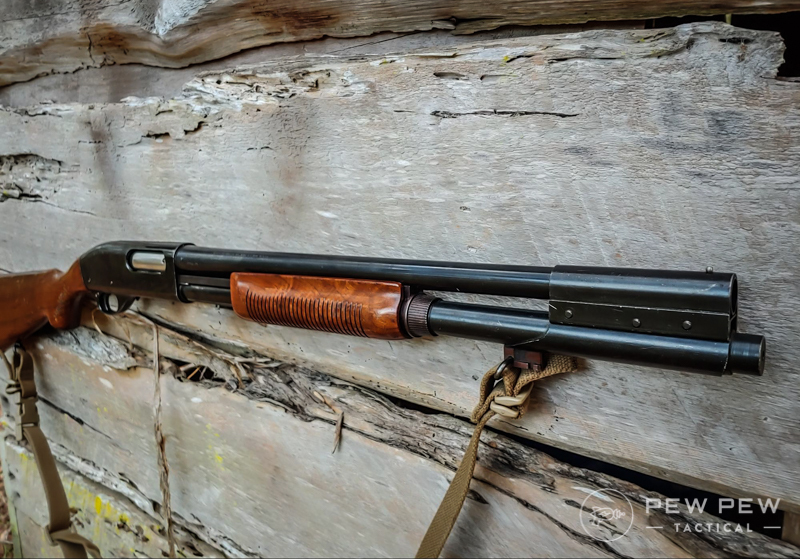 The Wingmaster 870 features a vibrant blue finish and American walnut woodwork. It’s slightly more expensive than the Express model but harkens back to the old school cool look of the Remington 870. One of my favorite shotguns are the Marine model 870s. They have an Electroless nickel plating that gives them a stainless steel appearance. This finish is corrosion proof and is designed to be used in saltwater conditions. 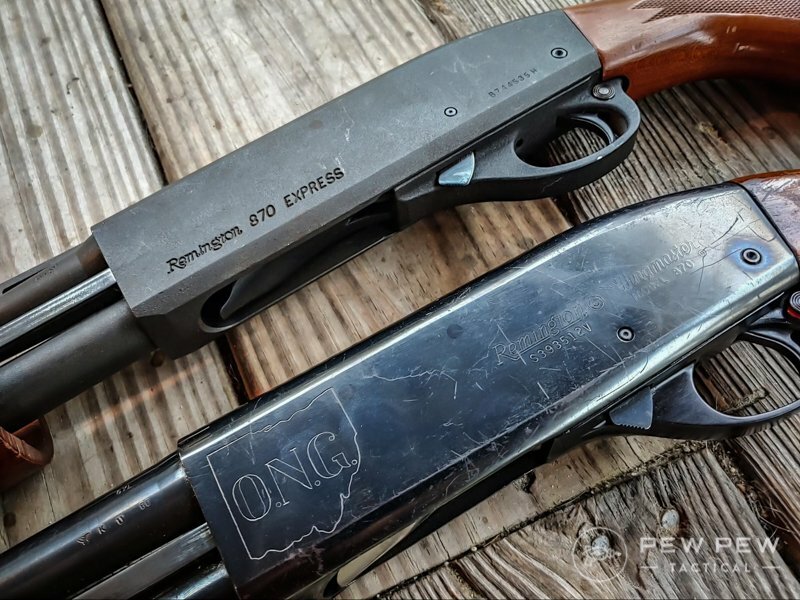 The 870 DM is one of the newest shotguns that is built on the Express series of guns. These guns are designed to accept magazines which makes them unique. They can take a 3 or 6 round magazines. Built on the Express receivers these firearms are not technically shotguns. They utilize 14-inch barrels but have an overall length of 26.3 inches. These guns utilize a PGO design and have become extremely popular. There are Marine models, DM models, and Hardwood models. 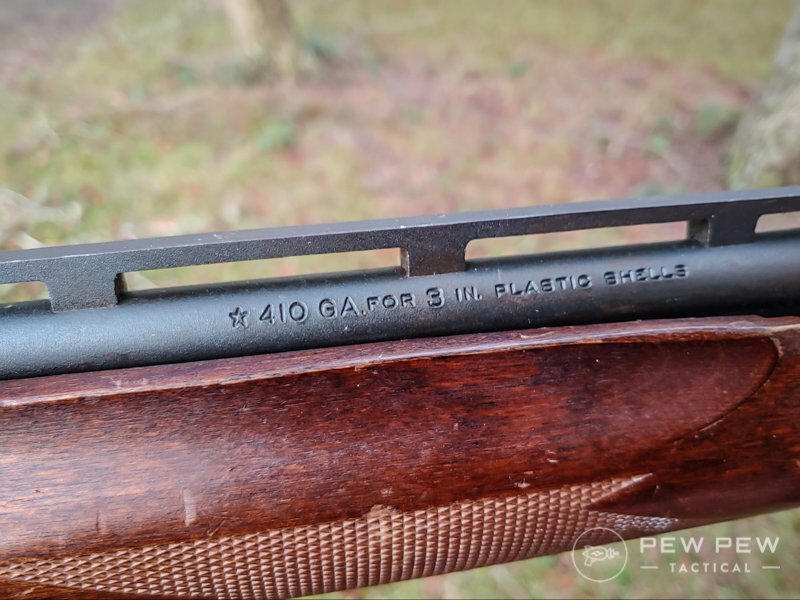 We’ve got the full review of the Tac-14 “not a shotgun” too. Without a doubt, the main competition to the Remington 870 is the Mossberg 500/590 series of shotguns. 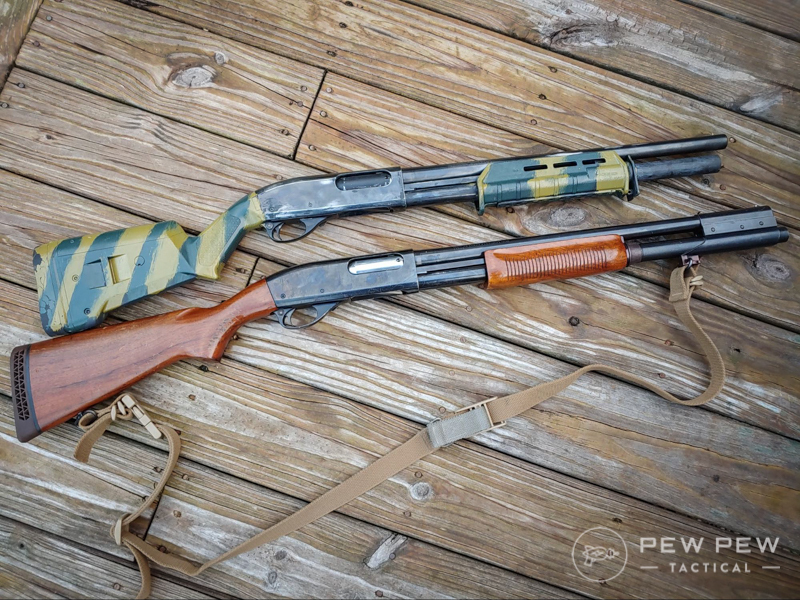 Both are American made and have long histories of being hunting shotguns, police shotguns, as well as serving in the US military. 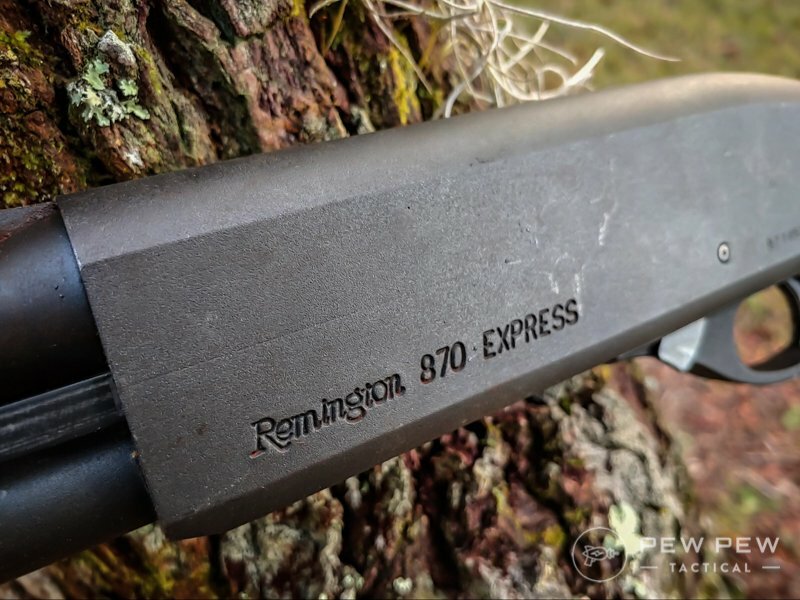 This isn’t going to devolve into a Mossberg vs. Remington debate, but I do want to highlight some of the strengths of the 870 series. The steel receiver is one of the points many people bring up and without a doubt, it’s stronger. However, it’s not like a shotgun receiver is going to split in half. To me, the biggest reason to acquire a Remington 870 is how smooth and refined the action is. 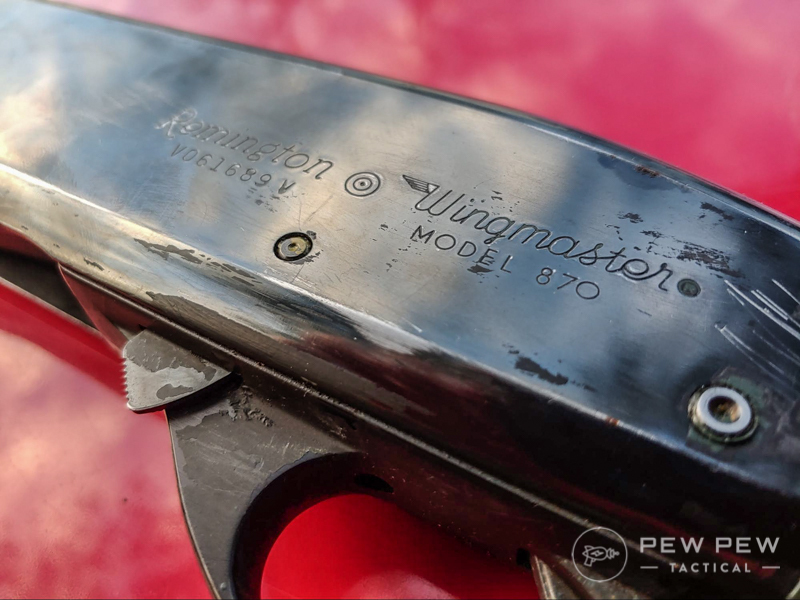 The Wingmaster models, in particular, are ultra smooth and feel ridiculously smooth. There is almost no slop in the action, and the pump and bars won’t twist with use. Everything moves, clicks, and slides with a degree of smoothness you don’t see in a lot of guns. 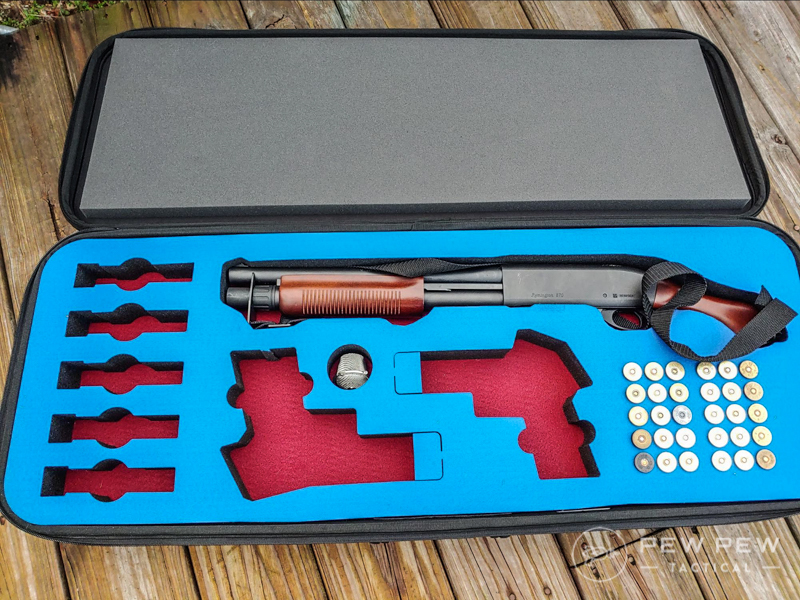 The vibrant blue finish is something I feel we lack in modern firearms, so I adore the Wingmaster series for their continued dedication to a true blue finish. 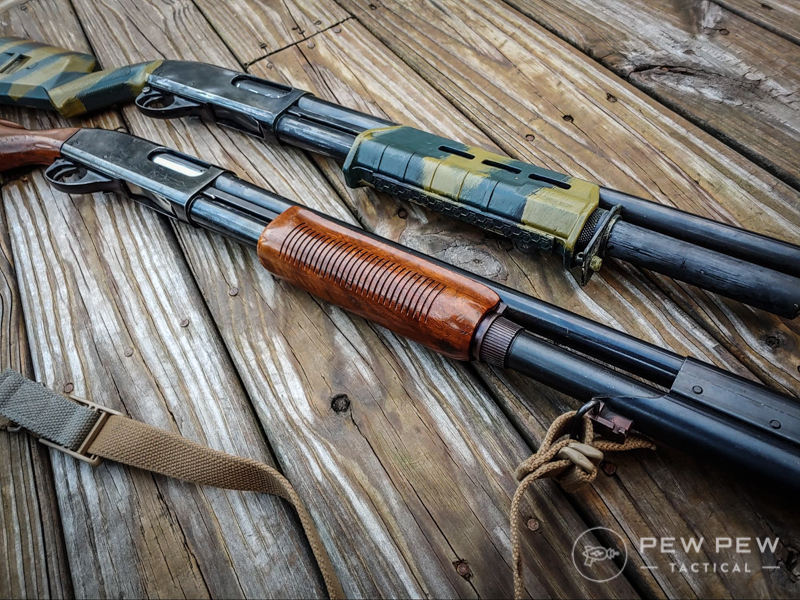 Best of all, the Remington 870 is a well-reputed firearm with a long history of service. It’s reliable, straightforward to use, to disassemble, and to accessorize. The popularity of the gun has made it easy to customize, as well as to replace parts if something ever breaks. 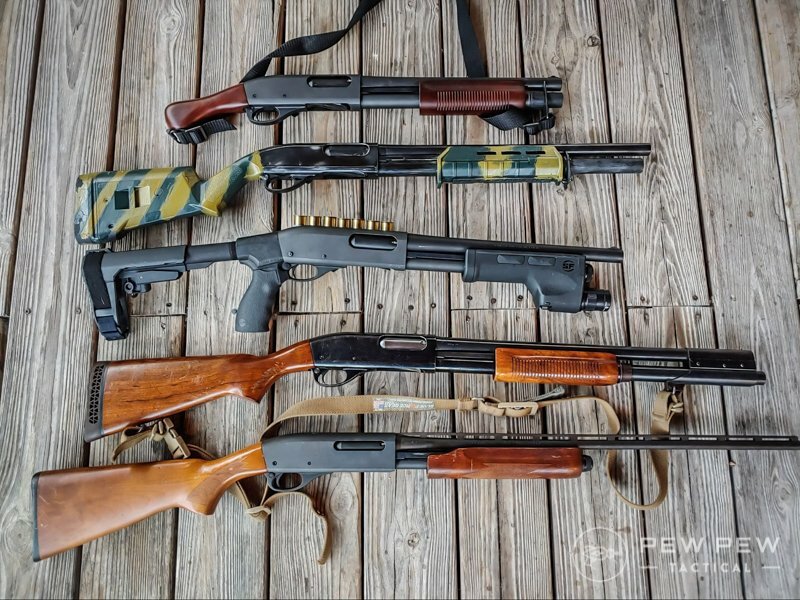 We go deeper into the Mossberg 500 vs Remington 870 debate in our 5 Best Home Defense Shotguns. As an owner of five 870s, including an Express 410, a Wingmaster pawn shop score, a classic Army Model from 1971, and two Tac 14s I think I have a little experience with a variety of the guns. Admittedly the Tac 14s handle differently, and they’ve had their review here. However, we can’t leave them out of this. One thing I love about the 870 and pump shotguns, in general, is their utter reliability. Pump the gun, pull the trigger and it goes bang. With the Remington 870, the action happens to be ultra smooth especially after it’s been worn in a bit. The actions of my Wingmaster guns is so smooth I can pump it with one hand and inertia. I don’t mean the classic movie style where you grab the pump and shoot it up and down. I suggest holding it by the grip and pumping it up and down can work the action. Recoil will depend on the caliber. The 410 is a real sweetheart and its perfect for young or recoil sensitive shooters. This old Express and I used to go to town on squirrel, rabbit, and other small game. These days its been a go-to for pest removal. I do plan to pass it down to my son and teach him the basics of shotguns very soon. With the standard 12 Gauge Wingmasters that extra weight from the steel receiver helps a bit with reducing recoil, but it’s still a 12 gauge. Proper technique will help a lot when it comes to fighting shotgun recoil. If you can master the technique and rhythm, you’ll have no issues with a Remington 870. In terms of reliability its a pump action shotgun, there is very little that can go wrong. The key to the gun’s operation is extraction and ejection. 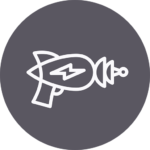 Shotguns can be picky, and some guns need high brass to feed, eject, and extract successfully. The Remington 870 isn’t so picky. It’ll grip and rip brass regardless of how long or short it is. The gun isn’t picky between different loads and seems to eat them all equally. The only rounds that will give you trouble are the small Aquila mini shells that seem to have issues feeding into the gun. Let’s be real here though, and these rounds are far from typical. The trigger is surprisingly nice among all of my Remington 870s with the 1970s National Guard model being the cleanest of these triggers. It has a short pull, that’s very light and entirely consistent. There is some overtravel, but very little. We’ve talked about how smooth the 870 is, but let’s look at the rest of the ergonomics. The placement of the safety is perfect with straight stocks as well as pistol grip stocks. It can be reached with the thumb or trigger finger. Placement of the slide lock release is forward of the trigger guard and is also very easy to reach with the trigger finger to release it. 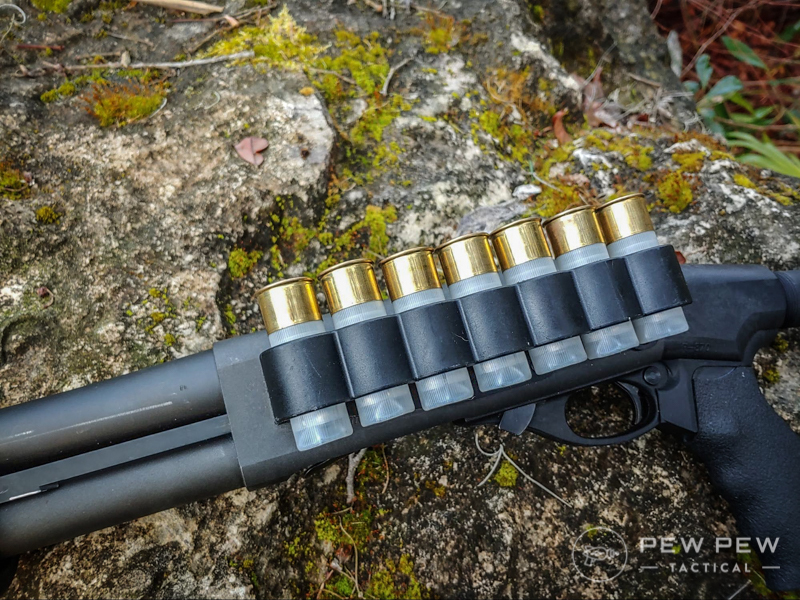 The 870 uses a standard shell lifter that needs to be pressed out of the way to load the magazine tube. Rounds slide into the magazine tube easily and click into place with a very audible sound. The magazines can be unloaded without having to pump the gun. Rack the action to the rear, push the shell elevator inward and then use two hands to press the right and left shell latch. The rounds eject from the magazine tube and are easy to remove. This is a great way to preserve the rim of your shells if you need to unload your gun. It’s not perfect for everyone in a stock configuration. Lefties will hate the safety and pump release for sure. However, this tried and true gun works and is easy handling for most shooters. I mean it is a shotgun. At the range the 870 is effective it’s more than accurate enough. 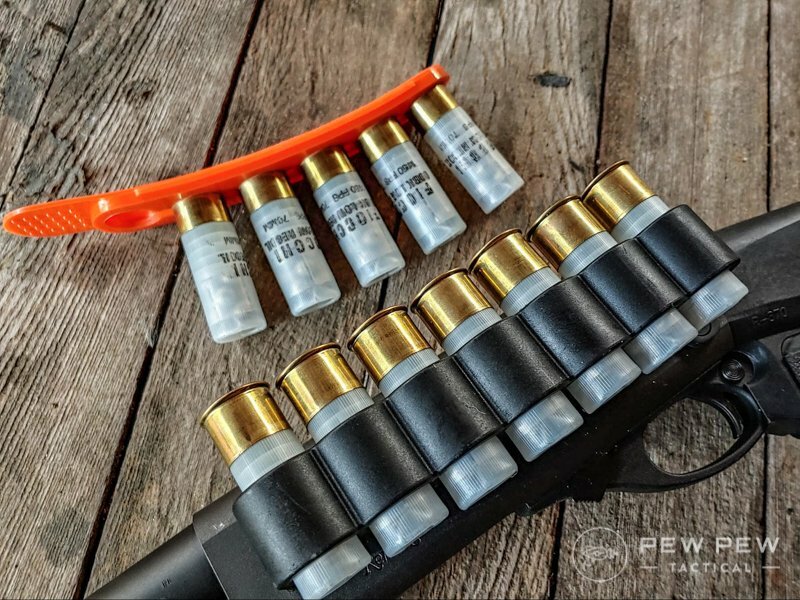 With the right choke and ammo, you can certainly reach out there with, and of course, slugs are primarily dependent on the ammo and barrel. The Remington 870 has had its time to grow and evolve. Any problems the gun has ever had is gone by now. The manual action of a pump action shotgun makes it extremely reliable. The weapon feeds, ejects, and extracts with boring consistency. The Remington 870 is the AR 15 of shotguns. It’s age, popularity, and easy means of customization has given it a massive aftermarket. You can do nearly anything you want to these guns, including turning them into bullpups. The Remington Express gets a 3 out of 5. The matte grayish finish is merely okay and far from eye-pleasing, as is the ugly synthetic furniture. Although the Hardwood models aren’t bad. What drops the Express score is how good the Wingmasters look. 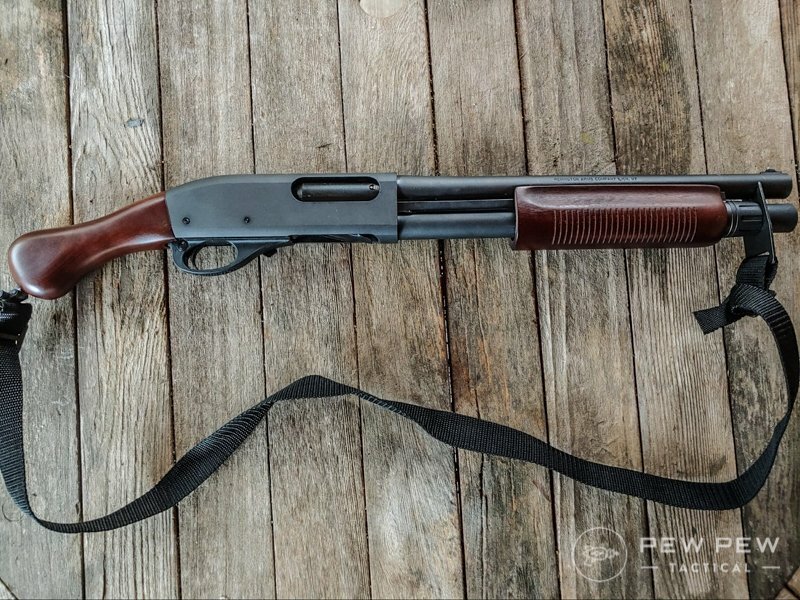 The classic lines of the pump action shotgun combined with a deep blue finish and beautiful American Walnut makes everything else seem a little cheap. The Remington guns tend to cost a hair more than comparative Mossbergs. Both are American made shotguns, but that steel receiver will push the cost up. However, these guns are still very reasonable, especially on the used market. Another primary reason to own an 870 is your ability to customize the gun to your needs with a wide variety of different pieces of gear. As a big shotgun fan, I try out a ton of shotgun based kit from ways to carry ammo to direct customization of my guns. My Pawn shop special 870 and TAC 14 standard sees a lot of parts swapping for testing purposes and over time I have found a few I can’t live without and wanted to share them with you. The Magpul SGA furniture is the perfect compromise between the benefits of a 90-degree pistol grip and stock and standard shotgun straight stock. The SGA stock is lined up like a standard stock, but the pistol grip takes a sharp downward angle. This mimics a 90-degree pistol grip and better distributes the weight of the gun between both hands. A standard stock puts most of the weight on the pump hand, and this makes it hard to hold the gun up and ready when using your nonfiring hand to accomplish a task. The SGA Stock makes it easy to hold the gun up when your nonfiring hand isn’t present on the pump. You can also adjust the length of pull for shorter shooters or to make up for tactical gear. You do this by inserting or removing spacers. The SGA stock also points and goes to the shoulder naturally like a standard shotgun stock. It’s the perfect compromise for the Remington 870. The Magpul pump offer MLOK slots to attach accessories too, and on top of that the pump’s design is a little longer in the rearward section. This makes it easier to reach for shooters with short arms. The pump is textured for a sure grip and very easy to install. Attaching a light to a pump action shotgun can be tricky. The recoil of the might weapon makes it easy for lights to be dismounted. Also, things like pressure switches are tricky on a gun where you are rapidly pumping the action. They can easily disconnect. Lights mounted on the barrel and magazine tube are not intuitive to reach and turn on in a fast-moving situation, and forget about any momentary switch. For serious tactical use, the Surefire DSF 870 is the best option out there. The light is built into the pump, is blindingly bright, and the controls are all ambidextrous and positioned for quick and easy use. This is a perfect option for a home defense shotgun and makes it very easy to establish proper ID on a potential threat. 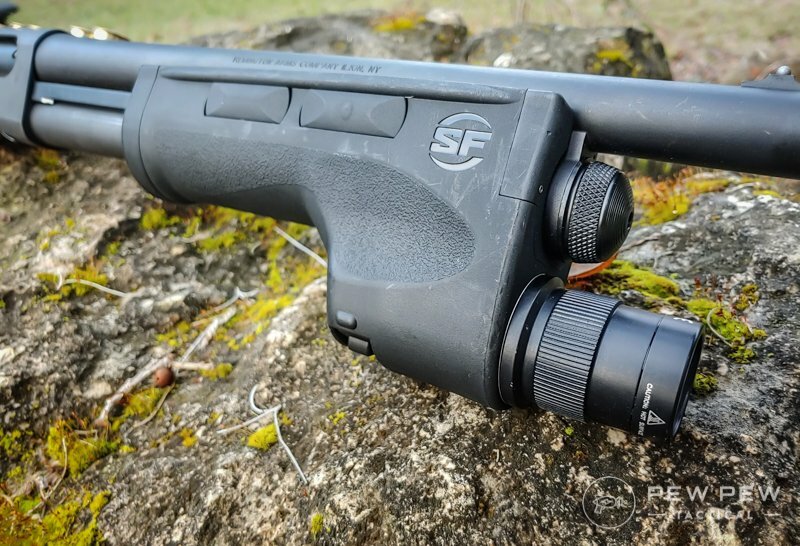 Without question, the Surefire DSF 870 is expensive but worth every penny. The TAC 14 is not a shotgun and cannot use stock, but they can utilize a brace. The SBA3 is likely one of the best braces on the market. It’s a five-position adjustable model and is an excellent addition to the TAC 14 series of guns. I installed it with an Ergo Remington 870 adapter that allows the use of standard AR buffer tubes and pistol grips. The SBA3 makes the TAC 14 much easier to handle. With a brace, the TAC 14 is a short and vicious CQB weapon. For indoors use the shorter the gun, the better, and it’s harder to get shorter than the TAC 14 and a brace without a tax stamp. The SBA3 doesn’t just work well, but it looks adorable and gives the gun a modern tactical appearance. Shotguns have a very low capacity so carrying extra ammo on the gun makes sense. Sidesaddles are pretty stock standard on shotguns, and there are tons of them out there. Oddly enough ProMag makes one of the best. It holds seven rounds total and is made with polymer, specifically carbon fiber filled polymer. Each shell slot has adjustable tension to keep the shells in place. This is unique and important. Shotgun shells vary in size and that include width, just by fractions of an inch. However, this means some loads will fit tightly and others loosely. The Archangel side saddle will allow you to adjust the tension as necessary to ensure they all fit comfortably. You can also mix and match loads and adjust tension if needed. Also, you may want to increase tension if you are hunting and crossing rough terrain, or in tactical situations for keeping the shotgun as a secondary and slung over your back. It’s a neat, and practical design for a side saddle. One problem with the shotgun is the size and weight of the ammo, the tube magazine, and ways to effectively carry extra ammo. Because of that, I’ve tried out a lot of different options. I have a few I like. Just recently I talked about this thing on my It Came From Amazon article, and I’ve only grown to love it more. This thing is a Pez dispenser for shotgun shells. It holds ten and has no problems mounting to MOLLE gear and keeping ten quick rounds on hand. The AmmoPal feeds 2 ¾ inch shells and is very easy to use. It also organizes your ammo in an efficient and easy to grab manner. The AmmoPal is one of my favorite means to carry extra shotgun ammo. With just a little practice I can load my gun or reload my side saddle quite quickly and intuitively. 5.11 is a legendary gear coming, and Viking Tactics is one of the best firearms training schools out there so a combination of both of them will guarantee some great equipment. 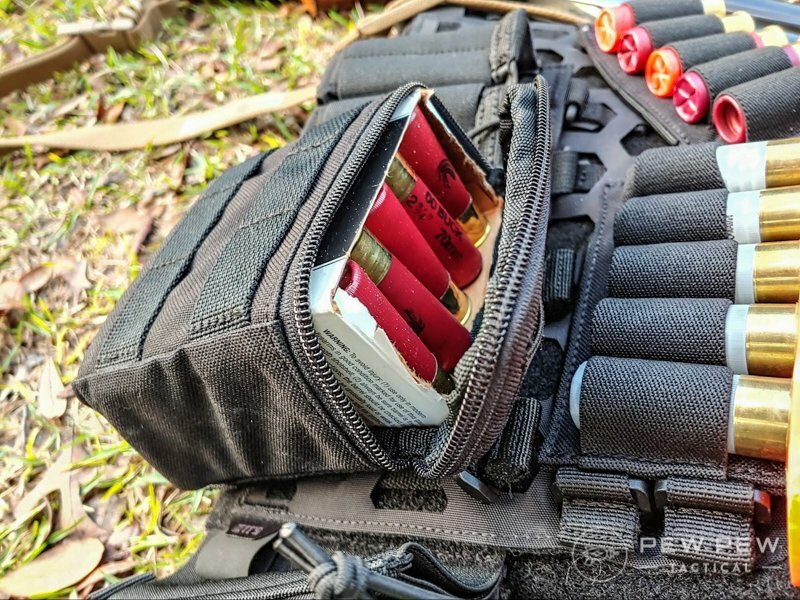 The 5.11 Shotgun pouch comes with input and testing from Viking Tactics, and it shows. One bag, one box, nice. This ammo pouch is designed to accommodate a full 25 round box of shells. Rip the top off and drop it in opened zip it up and go. There is a small slot at the top that allows you to remove ammunition one shell at a time. It’s not the fastest method, but one of the most efficient for carrying 25 rounds of ammo. The pouch is exceptionally well built and well made. It’s easy to use, innovative and impressively efficient. Another shotgun pouch that is a collaboration between 5.11 and Viking Tactics is the VTAC bandolier. This is a small vertical pouch that holds five rounds of ammo. I use these in coordination with the Viking Tactics Shotgun ammo pouch. These bandoliers are quicker, and in a pinch, I can reload much faster with these than the Ammo Pouch. These are my speed reload rounds if you will. 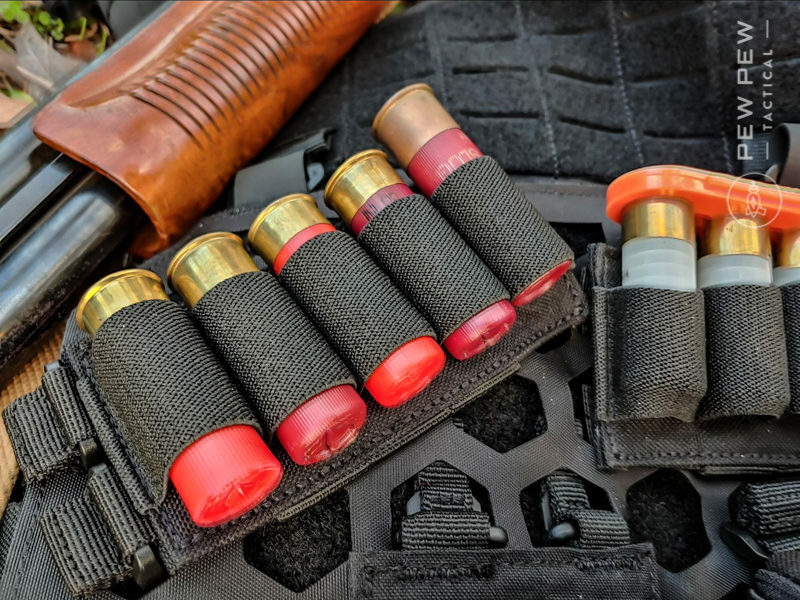 The VTAC bandoliers are also great for housing separate specialty ammo like slugs that you won’t want to mix up with your buckshot. The 5.11 Bandolier is another very well made pouch. The elastic is very tight, and the rounds don’t move a hair. The 5.11 VTAC Bandolier is well suited for battle belts or plate carriers as well. On top of the 5.11 VTAC Bandoliers, I like using these Tuff Strips that act just like speed strips but for shotgun shells. They hold six rounds together on a polymer strip for quick and organized use. I use these as a means to refill my gun’s side saddle. My side saddle is there to reload my shotgun quickly, and the Tuff Strip reloads the sidesaddle in a flash. They are odd but compelling. Ammo can sit in the bandolier with the strip attached and be ready to reload the side saddle in an instant. The can also be squeezed into an AR magazine pouch with easy, and you can carry a few strips in a double AR mag pouch. There are lots of options for slings out there, but I am a diehard fan of the always awesome Blue Force gear Vickers Tactical Sling. This quick adjust sling is perfect for the Remington 870. It shrinks and grows in an instant. It goes from tight against the body so you can climb ladders or get over obstacles with the gun banging around. In an instant, you can loosen it up and then toss it to your shoulder and get shooting. These slings are extremely strong and durable. I’ve had mine for years and through multiple deployments, and it still holds up. The Vickers slings come in tons of different configurations, including padded models, ultralight 1 inch wide models, and of course any combination of colors you could want. The sling works, and its currently the USMC issued sling for a reason. If you own a TAC 14, or even a Shockwave, then Peak Cases makes a slick little way to carry your gun as well as some ammo, and two handguns. This case was some excellent laser cut foam and looks amazing. 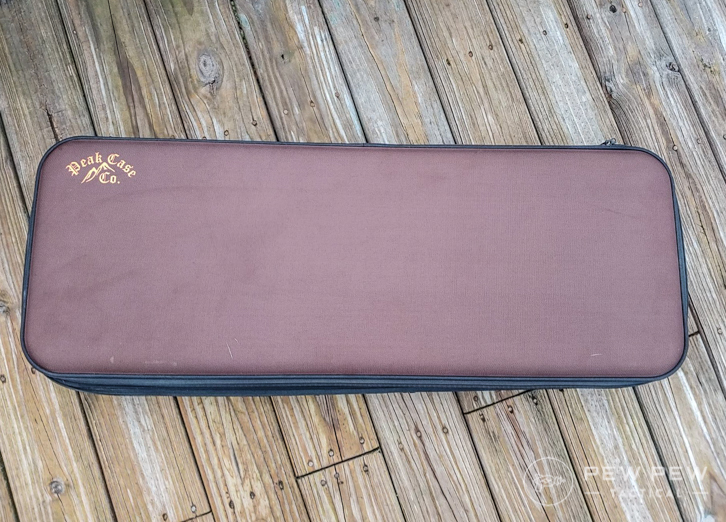 I love the look of my TAC 14 Hardwood model in the case. It just looks fantastic. Not only that but it is TSA approved, it protects your weapon and is very well made overall. THey make a Guitar case model too if you need those extra style points. 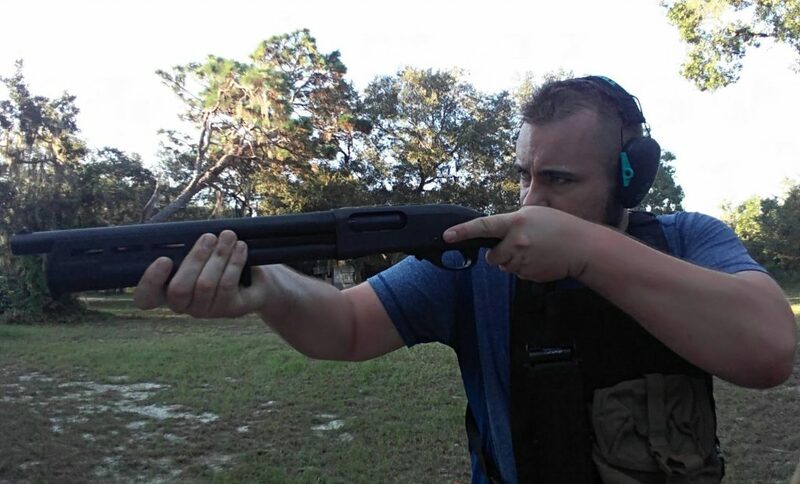 The Remington 870 is a fantastic shotgun. It’s carried the company for years and has been in constant production for a reason. The design is impeccable and as far as pump action shotguns go there isn’t much this one can’t do. It’s easy to shoot, reliable, powerful and easy to customize. What do you folks think about the Remington classic? Want to take a look at its main competition? 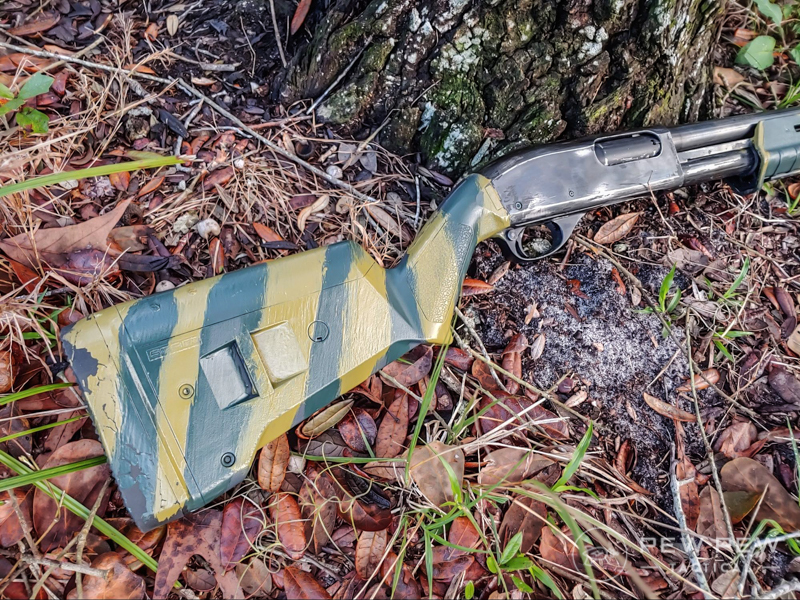 Check out Best Mossberg 500 Upgrades. Lets see a picture of the pistol brace installed. You can see the brace installed on the top picture of the article. I have been a fan of the 870 since the early 80’s. the original express model’s safety was easily changed out for a left handed aftermarket one ! One up grade I have done to all my pumps is replace the shell follower with a GG&G stainless follower, way more dependable and smoother than the factory plastic one. As far as tough I have and still shoot an 870 that hit the asphalt after coming off the roof of a truck @55 mph ! Just curious: I don’t have a shotgun. But between the last too articles (the Amazon one and this one), it seems like you move your shotgun shells a lot. If I’m understanding correctly, you move them from somewhere on your body (in a bandolier or pouch of some sort), then to a side saddle mounted on the shotgun, and then feed it into the shotgun. Is that really the fastest way to reload? It seems like a step or two too many. Again, I don’t own a shotgun so I don’t know, just curious. The link description says Mossberg 870, fyi. Gave me a laugh but might want to fix.